Enjoy a Magical Winter Getaway at Ski Town Condos! While staying at Ski Town Condos you will find a variety of activities to enjoy during the magical winter months. Learn & explore a northern pastime in the beautiful San Isabel National Forest as you glide through the woods with Monarch Dog Sled Rides. Enjoy a scenic horseback ride along Chalk Creek and overlooking the spectacular Chalk Cliffs with Arkansas Valley Trail Rides. Take an adventure snowmobile tour with Monarch Snowmobile Tours and Rentals where hot chocolate & coffee are always complimentary by their cozy fireplace! Feel right at home in our quaint 2 bedroom, 1 bath condos with a full kitchen, washer/dryer, wireless internet, and a hot tub in the gazebo! Winter rates are $165 to $195 per night. 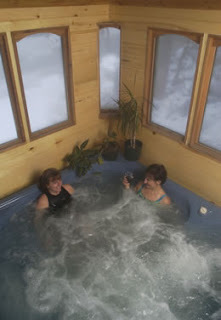 Concierge services at Ski Town Condos vacation rental keep your vacation planning time short and the variety fun! Call today to make your reservation at 719-539-7928.